What follows is a featured story from Anders Samuelson, a student of the Agile Coaching Institute. Anders is a project office director focusing on agile transition for his team and broader R&D organization. He and his team took the Coaching Agile Teams class in October 2012 bringing home an improved mindset and toolbox which since has greatly helped them further enhance their agile ecosystem. Self-organizing high performing teams – one of the overarching promises of agile – is it just a myth or can you actually get there? My first real life experience with agile, and in particular with Scrum, came back in 2007. At the time, I was working as a project manager in the running for a PMI PMP certification, and so quite the traditional PM person. However, I also had a great interest in team dynamics, though I was struggling finding effective tools addressing the area. Sure, I was familiar with the FIRO model and Tuckman’s stages of group development and how to leverage Situational Leadershipin conjunction with the different phases. But even though I could get a team to grasp these models on a conceptual level, making them tools adopted by the team in their everyday work proved much more difficult. What struck me as odd at the time was the fact that Scrum talked about self-organizing teams as a centerpiece of the puzzle, but gave no guidance on how to get there. When I joined a consultancy firm shortly after, solely focused on services in the agile/lean domain, I was eager to find/learn the secret behind getting a newly formed team into a state of high performance with self-organization as one key ingredient. The answer came one day when a colleague enthusiastically introduced me to his first stumbling steps deploying a model called “Five Dysfunctions of a Team” at a client. Even though, due to the nature of agile consulting, neither he nor I succeeded in truly experiencing the power of the model when used over a longer period of time, I was convinced that I’d found the tool I had been searching for. Fast forward a few years. I currently work at QlikView, a company that truly believes that its people are their main asset, putting the significance of teamwork at the very heart of their core values. As director for the project office leading a group of individually skilled project managers, one of the key challenges is to make sure that they operate as a team and not just as a group of people focusing on their respective team(s). A year ago I realized that I was failing this challenge. 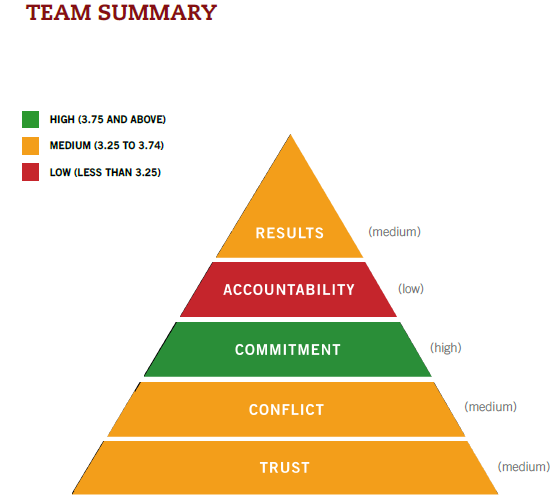 Even though the majority of the team was involved in the same large project, the focus of each member was predominantly on their individual feature team(s), and so failing to leverage the potential value of being a true team. Said and done, April last year we gathered for a full day, the quarterly offsite, to focus on adopting the tool Five Dysfunctions of a Team, kick-starting a new phase of our team journey. What fascinated me in preparing for the day was how easy and straightforward it was. The model itself and the accompanying Field Guide comes with a lot of tips and suggestions, but even more, all those exercises that you have done on team building days, project management courses, etc. suddenly get a new coherent context. Trust, Conflict, Commitment, Accountability & Results…it all suddenly just fit. Since most members of the team were only vaguely familiar with the model, a good part of the day was spent on each of the 5 fundamentals, with at least one exercise connected to each in order to get a better understanding and start improving the behaviors connected to it right away. By the second part of the day, the real fun started – digging into and discussing the online assessment that all team members had done before the meeting (See Figure 1). Yet another revelation working with the tool emerged. The nature of the assessment report made it very natural and straight forward to start discussing and actually have healthy conflict around questions that otherwise often are avoided in the daily interactions. Having understood the connections between the five fundamentals and their impact on performance, the team quite quickly could start identifying situations and (lack of) actions in everyday work reflecting the assessment result. The session ended with the team committing to focus on three sub-areas connected to Trust, Conflict, and Accountability over the coming months. Getting back to the office, it was evident that something had changed for the better. Slowly but surely, aspects of the model were discussed and used to improve the team performance, during morning meetings, weekly meetings or ad-hoc discussions. On our next monthly meeting, the team was divided into three groups with the mission to discuss the progress on each chosen focus area, and to make a drawing manifesting the commitment (Figure 2). The drawing then, of course, was posted on the wall in our team area for yet another everyday reminder of their journey. By November, I was quite confident that we’d made significant progress. The energy and discussion intensity in weekly meetings, the level of team members’ helping each other out on short notice, interest in helping other team members learn and grow, attention to and discussions about the greater value of a project office, focus on a common goal and, not the least, less and less need or demand for me to be involved in daily operative questions – all indicators of a maturing team. Still I was not quite prepared for the result of the online re-assessment (Figure 3). Going into the offsite meeting, I was a little bit worried that the team would be too content with the result to keep on the journey, but it was immediately clear that they felt there were many steps still to be taken – honing in on one of the most difficult parts – keeping each other accountable. So going back to my initial question — Is the promise of self-organizing high performing teams for real? Yeees! And the good news, there is no magic involved. It just takes faith, endurance and commitment. Well, what are you waiting for? Go and help your team embrace their dysfunctions!